When it comes to your centerpieces. the vessel that holds your flowers is just as important as the blooms inside. The right container will help set the tone for your reception. So say goodbye to clear glass and say hello to one of these 35 creative ideas. 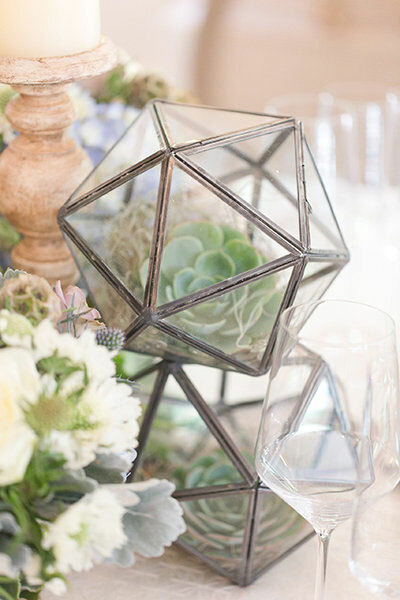 Display succulents inside of modern geometric terrariums. A birdcage is a wonderful addition to your spring tablescape. A shallow bowl really puts the emphasis on your overflowing centerpiece. Surround a geometric case with flowers instead of just placing them inside. Create a gorgeous clean look with milk glasses against a white table and bold flowers. Create an ombré look with flowers in varying shades lining your table in metallic cups. It doesn't get more tropical than displaying your flowers inside of a pineapple. Perfect for a fall wedding, place your flowers inside of a pumpkin. Repurpose antique candleholders to hold individual flowers for a unique look. A bevy of vintage vessels come together in a gorgeous multi-tiered centerpiece. Transform a classic glass vase into something a bit more fun with some glitter paint. A stone planter plays beautifully against silver dishware. Channel Beauty and the Beast with a floral arrangement under a dome. Copper buckets glow against soft candlelight. Rose gold vessels add a luxe boho vibe to your tables. A golden cup is a simple and elegant choice. A tall golden vase works especially well against an autumnal color palette. Painted mason jars are a simple and chic DIY centerpiece. Gold goblets complete this classic, romantic wedding color palette. A bronze pedestal bowl surrounded by mix-and-match candleholders creates a vintage vibe. A silver planter shines against muted flowers. A black pedestal bowl is an unexpected yet elegant choice. Antique bottles in various hues covered in moss creates a wonderful, earthy look. A mirrored vessel gives your table a seamless look. Pair your mirrorred flower holders with a patterned tablecloth for a glamorous look. Adorn your flowers on a small display shelf. Make your bold flowers stand out even more by displaying them on a tall gold stand. Why limit yourself to one color? Gather bottles in various shades for a fun, colorful look. Enhance your tables with colorful vases in unique shapes. Alternate blue and clear vases for an unexpected touch. Create a wonderfully rustic vibe by displaying your flowers inside a tree trunk. A wood crate is a simple choice for a shabby-chic look. A low wood box is the perfect fit for a branch centerpiece. Adorn your tables with mini trees for a beautiful nature-inspired look. Drape greenery garlands along your tables.